Confirm that you have completed all of the preparations for installation. See the instructions in Preparing for Installation. Confirm that you have completed the installation of the server in its rack. 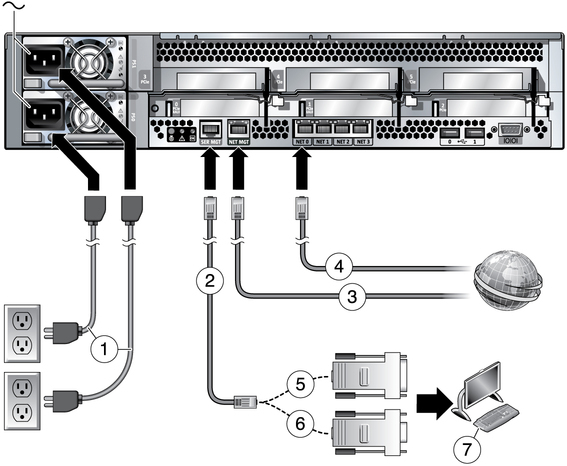 See the instructions in Installing the SPARC Enterprise T5120 and T5220 Servers. Connect a terminal or a terminal emulator (PC or workstation) to the service processor serial management port. A null modem configuration is needed, meaning the transmit and receive signals are reversed (crossed over) for DTE to DTE communications. You can use the supplied RJ-45 crossover adapters with a standard RJ-45 cable to achieve the null modem configuration. Note - When you power on the server for the first time and you do not have a terminal or terminal emulator (PC or workstation) connected to the service processor serial management port, you will not see system messages. (Optional) Connect an Ethernet cable between the server’s NET MGT port and the network to which future connections to the SP and host will be made. After the initial configuration of the system using the SP SER MGT port, communication with the SP and host is usually performed through this Ethernet interface. Connect an Ethernet cable between one of the server’s NET ports and the network to which the server will communicate. Plug the power cords into the power supplies and into separate power sources. To provide redundancy, plug both power supplies into separate power sources. The system can operate with only one power connection, but there is no redundancy in this case. The service processor runs on the 3.3V standby voltage. As soon as AC power is connected to the system, the service processor powers on, runs diagnostics, and initializes the ILOM firmware. After a few minutes, the SP login prompt appears on the terminal device. The host is not initialized or powered on yet. At the terminal device, log in to the SP as root with a password of changeme. After a brief delay, the SP prompt is displayed (->). At this point, there are many commands you can perform using the Integrated Lights Out Manager interface. Additional SP information, such as how to change the password and how to set up the SP network parameters is available in the online documentation set. After you start the SP console, the server initialization takes approximately 20 minutes to complete. When prompted, follow the onscreen instructions for configuring the Solaris Operating System on your host and enter the following configuration information. You will be prompted to confirm the configuration several times, enabling confirmation and changes. If you are not sure how to respond to a particular value, you can accept the default, and make future changes when the Solaris OS is running. Select a number from the displayed language list. Select a number from the displayed locale list. Select a terminal type that corresponds with your terminal device. Select the network interfaces that you plan to configure. If you are not sure, select the first one in the list. Select Yes or No according to your network environment. Enter the host name for the server. Enter the IP address for this Ethernet interface. (If subnet was Yes) Enter the netmask for the subnet for your network environment. Specify whether or not to use IPv6. If you are not sure, select No to configure the Ethernet interface for IPv4. Select either standard UNIX security (No) or Kerberos Security (Yes). If you are not sure, select No. Review the onscreen information and change it if needed. Otherwise, continue. Select the name service according to your network environment. Note–If you select a name service other than None, you will be prompted for additional name service configuration information. Select the type of domain name configuration according to your environment. If you are not sure, select Use the NFSv4 domain derived by the system. Accept the default date and time or change the values. Enter the root password twice. This password is for the superuser account for the Solaris OS on this server. This password is not the SP password. Log in to the server and explore its capabilities. showrev – Displays the hostname and system architecture information. Use the -a option with this command to see the patches that are installed. psrinfo – Displays information about the number and status of the processors and cores in the host. prtdiag – Displays system configuration and diagnostic information. Review the Solaris OS man pages and documentation for more details. Sun SPARC Enterprise T5120 and T5220 Servers Administration Guide.